YOUR VIRTUAL OFFICE IN THE CENTRE OF LISBON, NEXT TO THE SALDANHA UNDERGROUND, FROM 19.99€ PER MONTH. (1) In order to have your fiscal address in our facilities one must sign up for a 12-month membership. (2) Includes each month 4 hours of support by a multi lingual personal assistant as well as a Printing package of up to 30 B/W pages or 15 Colour pages. Additional pages (each): 0,10€ B/W and 0,20€ Colour. (3) Includes a monthly package of 80 min.for land line (Portugal) or 15 min. for mobile (Portugal). Additional top-up starting from 7,5€. Cost per min: 0,06€ land line and 0,34€ mobile. (4) Yellow and Grey meeting rooms, from 9h to 13h and from 14h to 18h on weekdays. 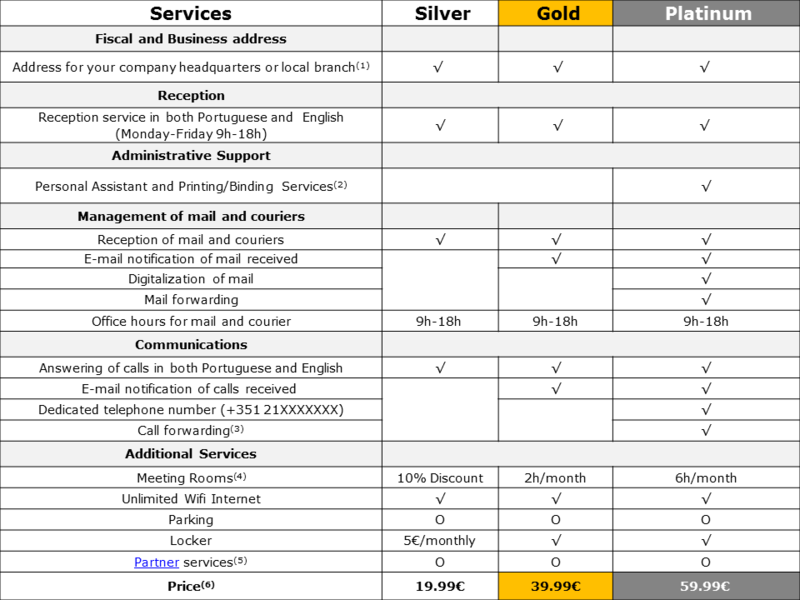 (5) Special discounts on services provided by our partners. (6) Prices for a 12-month membership. For 3-month memberships the prices are the following: Silver – 24.99€; Gold – 49.99€; Platinum – 74.99€. We reserve the right to reject requests by companies and / or partners and / or managers or directors who are in the process of dissolution, liquidation or insolvency, or if they are involved in any situation taking place in court or if they have any contingency with public authorities.